Actually, the 11-1/2th. Well, Socktober comes to a close and I have zero pairs of socks to show. I did manage to accomplish my goal for the month, trying a new technique. 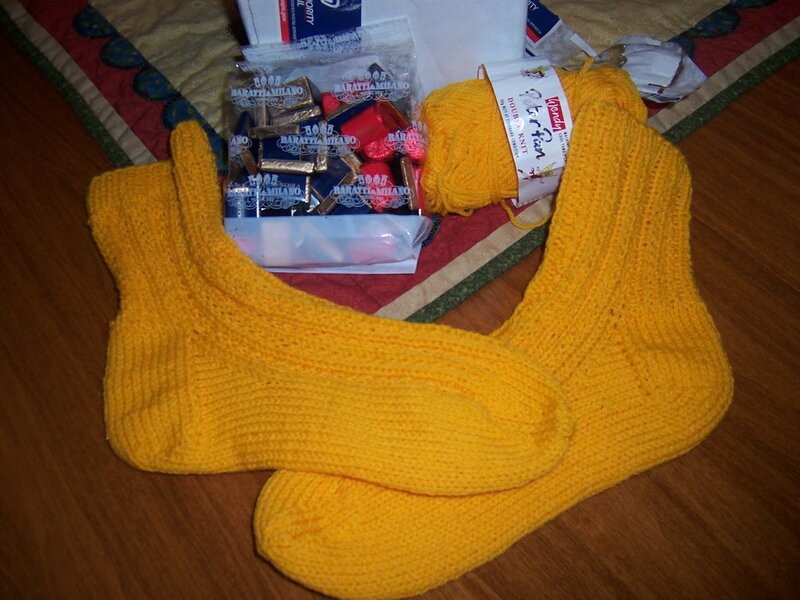 I wanted to try toe up socks. I didn't like it. It's not the technique's fault, I just didn't like it. It's not you toe-ups, its me. 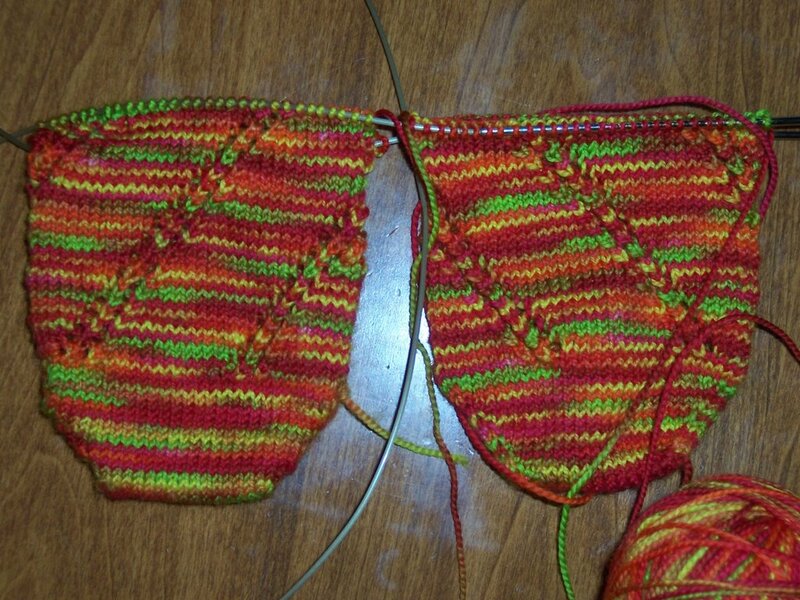 So, since I didn't finish my Socktoberfest socks, I decided to rip them out and start over, from the top. I am pretty okay with this decision. Plus, there's always next Socktober. The skull was such a pain to do. 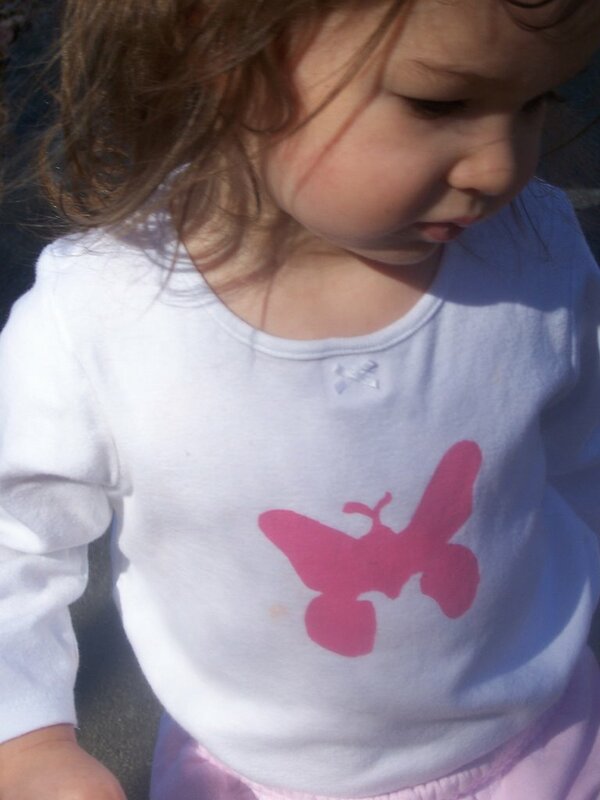 I won't recommend painting light colors on dark shirts. 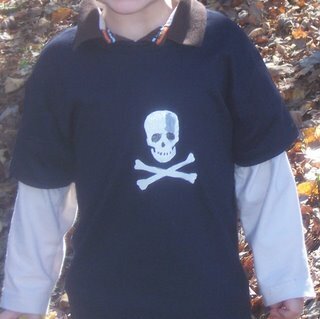 I had to put on three coats of paint and when I peeled off the stencil part of the skull peeled away with it. I thought it looked kind of cool anyway so I kept it like that. 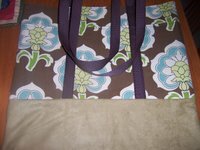 You can check out the tutorial on Craftster. Where is my @*&%^$ yarn? 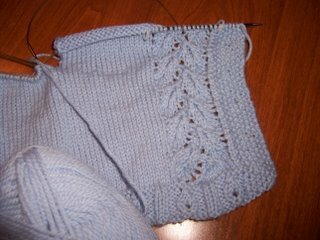 ** WARNING ** KnitPicks rant to follow. Please skip to the end if you only want sweetness. Serioulsy, KnitPicks, I love you and all, but a girl needs to be able to check the status of her yarn package. Telling me it has "shipped" is absolutely no frigging help at all. I want to know whether it is currently in Nashua and will be here tomorrow, or in Columbus, Ohio and won't get here till Friday. I know, in the big picture a day or two doesn't really matter, but when the mail truck drives up, I get a little heart flip waiting to see if there will be a nice large white package of new yarn shoved mercilessly into that tiny receptacle. Not offering a means to track that much-anticipated package shows me that you really don't care too much about the people buying your product. That and the fact that you aren't selling your 1-3 needles in anything bigger than 32" length really burns me. But, since you still offer the best price for good quality yarn, I'll overlook these customer disservices. 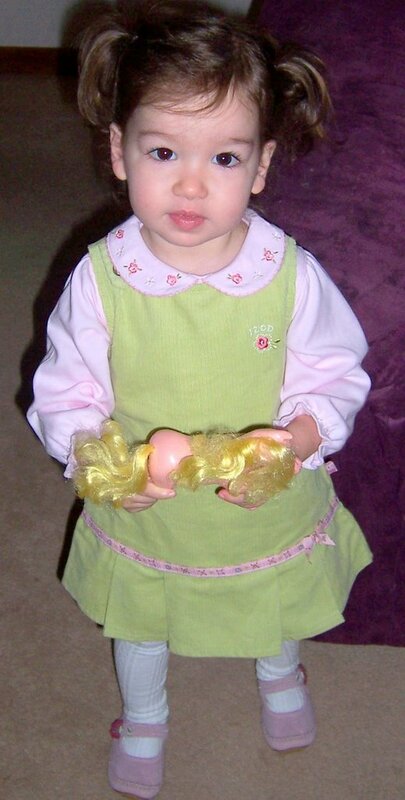 *I still need to sew on the buttons, I only placed them on the band for the purpose of photo taking. 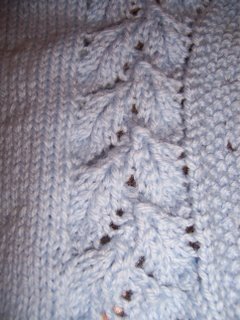 The leaf edging really makes this sweater look nice. 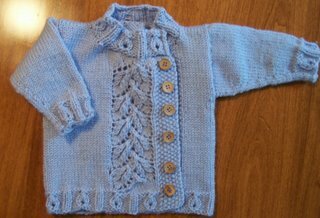 This sweet little sweater is for the second son of a co-worker and friend of my husband, due in January. 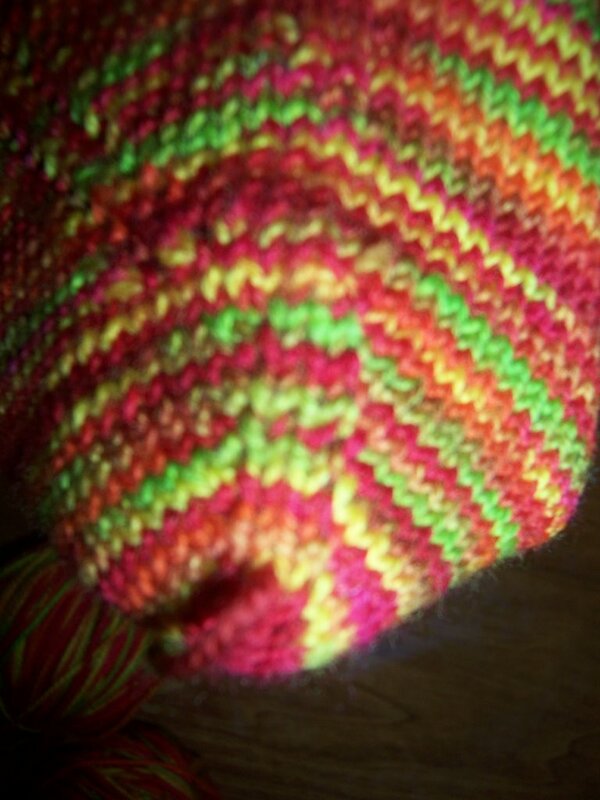 I will be making a pair of booties in the same yarn soon. 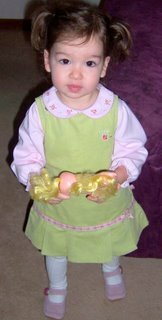 Then I'll be sewing it up and picking up the neckband. 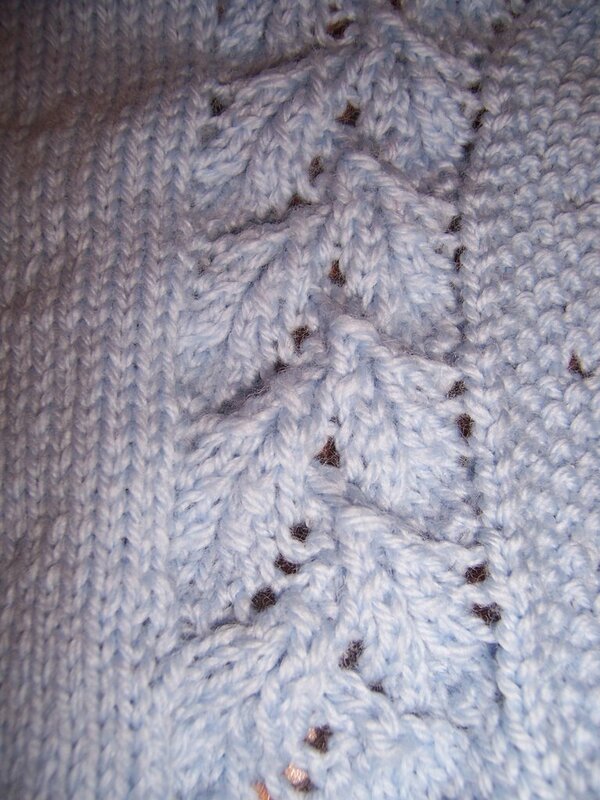 This was a very quick knit and fun too. I still haven't finished my Anastasia socks. I am a lousy Soctoberfest participant. I guess I'm a bit socked out. Once the Pea Pod is done, I'll finish those socks up and move on to non-sock projects. 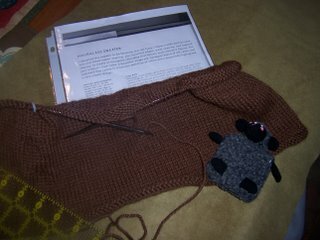 The next knits will be the Hourglass Sweater from Last Minute Knitted Gifts in KnitPicks Andean Silk (chocolate color) and a cabled alpaca hat for the boy. That boy needs a warm hat. And mittens too. 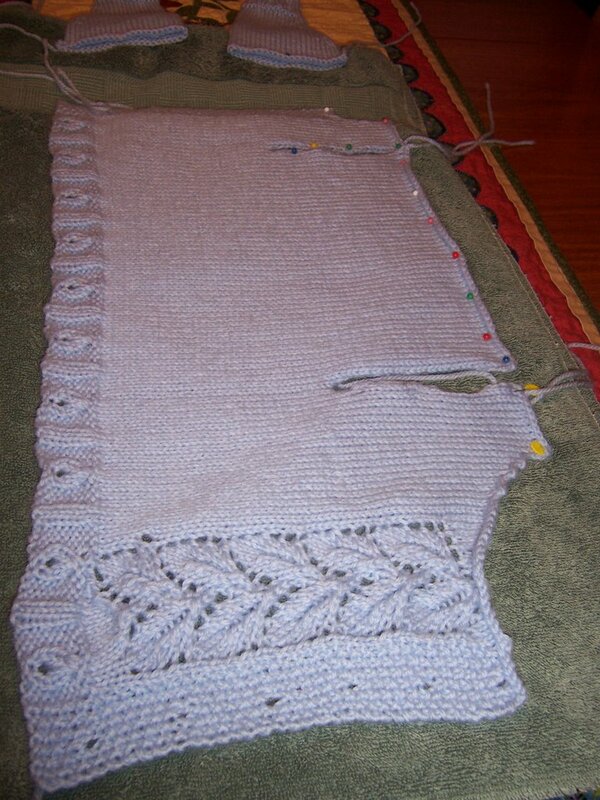 Not too much knitting going on here this week. I haven't even knit a stitch on my Anastasia socks since Wednesday night. I did get some work done on my Pea Pod Baby set. I really like this pattern. Great for a quick baby gift. 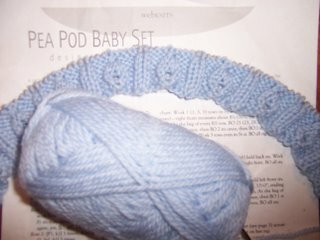 I'm not going to knit the beanie that goes with it because it's for a winter baby, and winter babies need hats that cover their ears. 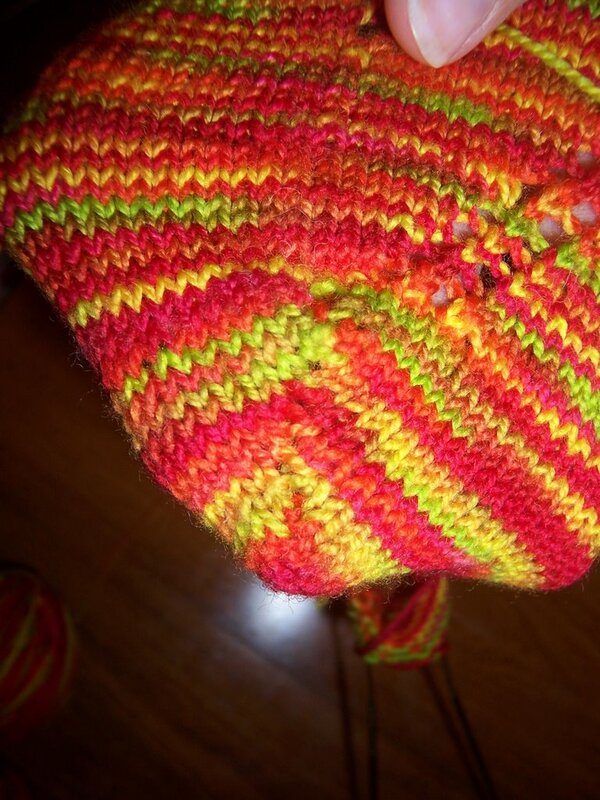 I'll probably knit up some booties to go with, we'll see. 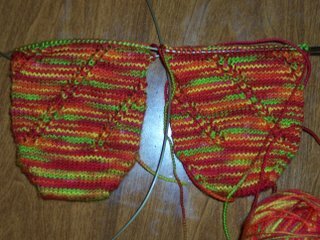 After the horrible attempt at a short row toe, I'm hesitant to try a short row heel, but this is Socktoberfest, and it's all about trying new things for me. Okay, my plan for Socktoberfest was to knit socks from the toe up, because I've been afraid to try and wanted to do something out of my comfort zone. My first attempt was just plain ugly, using the short row wrap and turn method. It took a few attempts until I actually "got it", then I still didn't like the way it looked. My second sock I cast on using the magic cast on, and it worked! And I like they way it looks. Of course I had to put them both on the same needle so now I'm working them both. 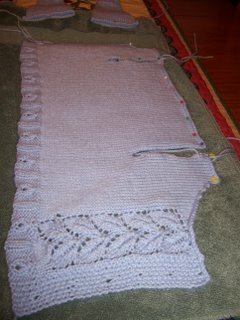 I may end up frogging the wrap and turn sock and re-knitting it using the magic method. Since they're just for me I might just leave it as is and see how they wear. 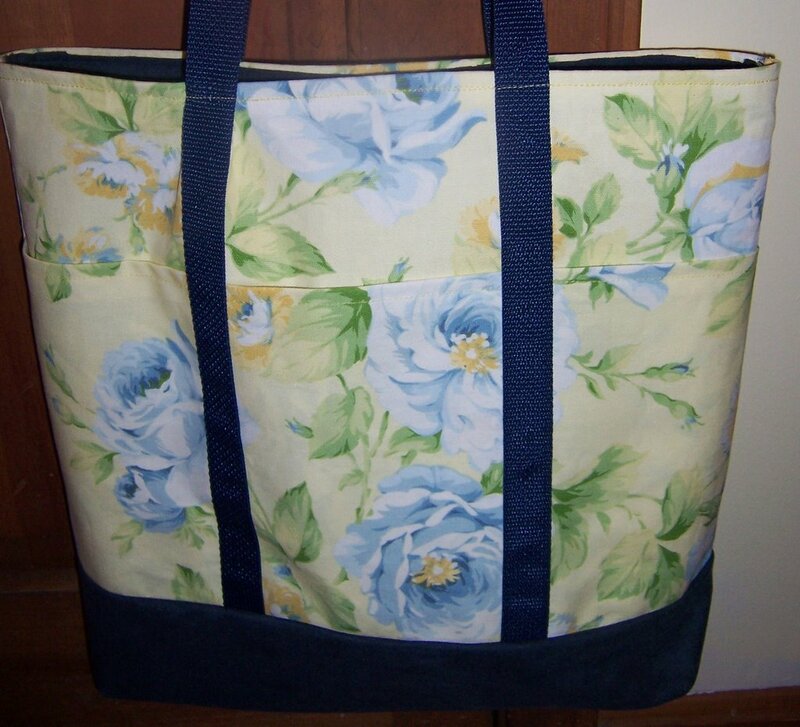 The pattern is Anastasia. I love the spiraling eyelets. The pictures really do not do justice to this yarn. It's Cherry Tree Hill potluck in brights. The colors remind me of New England in early Autumn. Bright reds, orange and yellows and just a bit of green left. 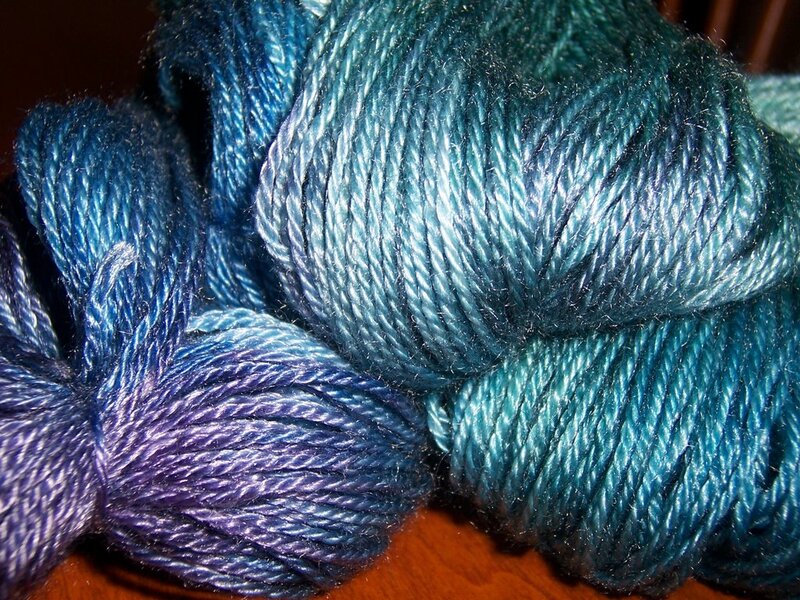 This is Gina's hand dyed merino/tencel sock yarn in the Sea Fairy colorway. Isn't it gorgeous? The thrill of victory, the agony of de-feet! 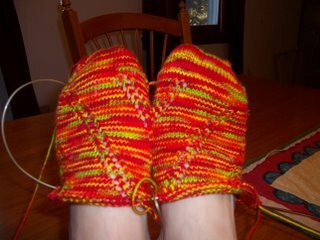 I am thrilled to show off my finished Hedera socks. These please me very much. 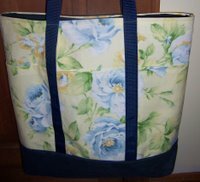 The pattern was a bit of a challenge for me; for some reason I could not memorize the four pattern repeat until very near the end. 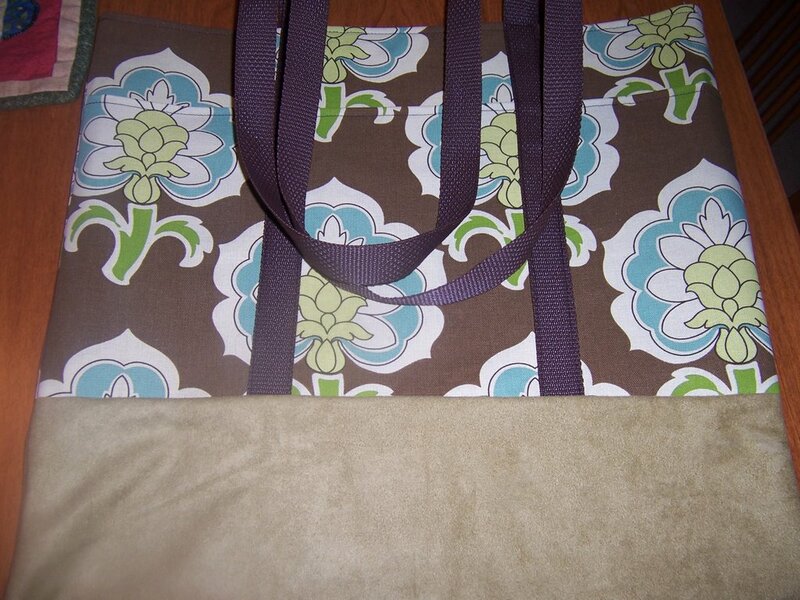 I had to have the pattern with me at all times. 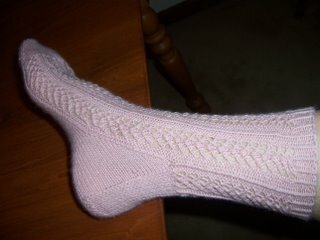 I made some mistakes, but for my very first lace socks, not too shabby. My assassin, Inkslinger42 offed me with style, including a delicious bag of Italian chocolates to ease the pain of death. Great job Tanya. The monthlong celebration of Socktoberfest kicked off yesterday. 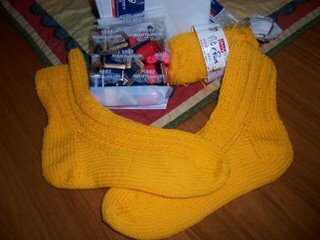 I am marking the month by trying a new technique, toe up socks. 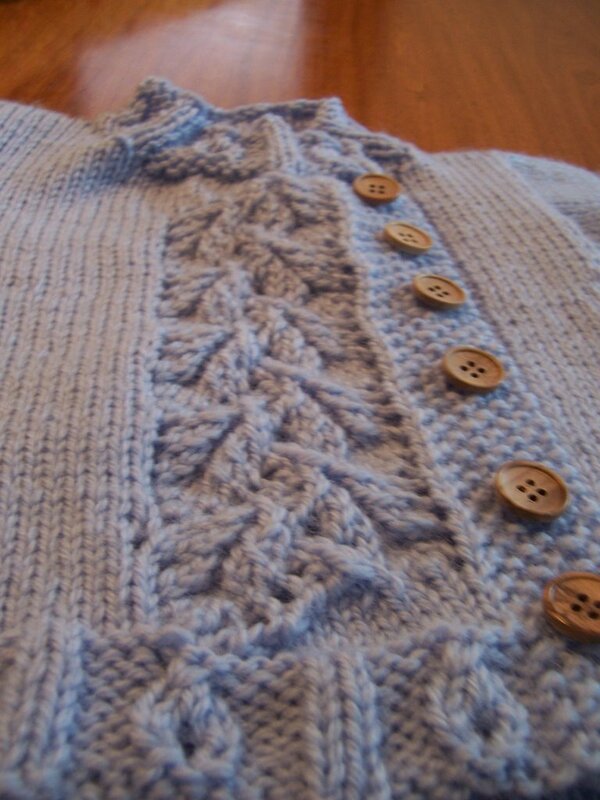 I'll be using Pepperknit's Anastasia pattern with Cherry Tree Hill yarn. How will you celebrate?